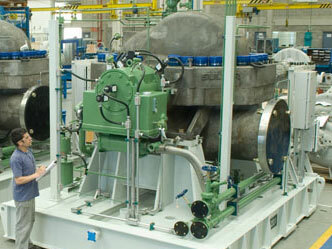 Kingsbury bearings perform well in a wide range of pump applications. Photo copyright Sulzer Ltda., Jundiai, Brazil. Kingsbury bearings can be found in a wide range of pump applications, including power generation, oil and gas, and water supply and treatment. In many instances, the OEM specifies forced lubrication. In such cases, we offer thrust and journal bearings either with a flooded housing (EQH flooded thrust bearing) or an evacuated housing (direct lube LEG bearings). Flooded bearings are typically capable of bi-directional operation and are well suited for load pressures up to 3.5 MPa and speeds under 60 m/sec. Direct lube bearings are preferable for pumps with higher loads and sliding velocities, and their performance can be further enhanced with alternatives such as chrome-copper pads to quickly dissipate excessive heat from the babbitted face. For many decades, Kingsbury has been supplying prepackaged thrust and journal bearing systems with significant advantages for pump applications. In the photo below, the non-drive end bearing (cover removed) illustrates the elements that allow this exceptional bearing to perform without an external lube skid. Kingsbury's exclusive CH System integrates a self-contained, load-equalizing, double-thrust bearing conforming to API 610, along with a built-in oil circulator and journal bearing, plus a separate journal bearing mounted on the drive end of the pump. Lubrication is autonomous, achieved by means of the oil circulator and collar, which serve as a viscosity pump driven by shaft rotation. It not only eliminates the external lubrication system, but also requires no emergency pump, accumulator, rundown tank or other special arrangements for oil lubrication. Additional motor control systems and electric power are also not needed for oil circulation. As a separate lube system is not necessary, cost savings can be significant. Equipment safety is guaranteed because, in contrast to a traditional system with an electrically driven external lubrication skid, if power is interrupted, lubrication continues and prevents damage from occurring to the pump bearings. With its autonomous lubrication system, oil flow continues until the pump bearings safely coast to shutdown. Upon startup, oil flow is immediately initiated and continues as long as the shaft is moving. Prepackaged fluid-film bearing assemblies are designed to spare the pump manufacturer the challenges of designing an appropriately sized system, sourcing the components, machining the housing, and assembling the individual parts. So, in addition to a lower purchase price, many of the engineering and assembly labor costs are virtually eliminated. Inquire about the CH Bearing System for your application. Learn more about the Kingsbury CH System. Download Kingsbury White Paper: "Operation and Current Developments of Self-Contained, Self-Lubricating Thrust and Journal Bearings Systems"